Powers: Lightning Dust is augmented heavily with the best magitech from her home universe that is decades more advanced than the magitech in universe TK78 (The Age of Heroes universe) in many fields. The following is what her augmented upgrades allow for. Magic shield generator: A shield that forms around her body that can withstand heavy amounts of firepower but uses all of her reactor's power. As such she can not use other weapons or powers with this up and it can be overloaded. If this happens the shock can temporarily take LD offline. Gravity locks: Bult in her legs they allow her to walk on walls, ceilings or stand on speeding objects without hindering her movement. Can not be used to pick up heavier objects as they only pull her onto a surface. They can be used to pull objects closer to her if they are within a few hoofs reach. carbon mesh bones: All of her bones were heavy reinforced with with magically reinforced carbon mesh that makes them all but unbreakable except for the the most horribly powerful of impacts. Enforcer Plate: Much of her body is protected by an integrated armor that is built for frontline combat, borderline unbreakable it can withstand forces and heat that will shatter and vaporizer steel and only lose some paint to show for it. 2x APSG mk’6 TL: Two twin barreled magitech SMGs that fire tiny magic bullets in a weathering hailstorm. What they lack for in firepower per a shot they make up for in sheer overwhelming volume of fire at a combined rate of fire reaching a horrific 12,000 rounds per minute. But this overwhelming wall of magic bullets is power hungry and she can not keep up sustained fire for long before needing to cool down and letting her LAY reactor recover. Skull Jack: Deployed from her front left leg this tools looks like many small tendrils that can invade one's skull by their ears, nose or other places to slither in to one's brain and read it or worse, force somepony to do something on her behalf. It is not deadly but can leave a pony with a crippling headache for weeks afterwards. Augmented brain: Lightning Dust's brain has been heavily augmented to work faster and handle all the feedback her augmented body feeds her. It is also what enslaves her to the Corporate will of her home universe. Only in a different universe has she found limited windows of true freedom to think for herself and struggles to hold on to it. Augmented eyes: Seeing in the dark? Infrared? She can do both and can with a limited degree zoom in to study finer details or spot things farther away. EL-class LAY reactor: Her heart and source of all her powers and life. Feeding of the magic of the world it far surprises the barbaric reactors of older times and is the most advanced piece of magitech from her home universe and is decades more advanced than what meny in universe TK78 believes is possible for it’s size. Backstory: In a far away universe the finding of LAY unleashed a new age of magitech that spiraled out of control with such speed nopony knew what to do or what was coming. Flying wagons, ships than cities took to the sky. Corporations gained power from it and pushed deeper into daily life as they replaced governments and soon the Corporate wars happened. 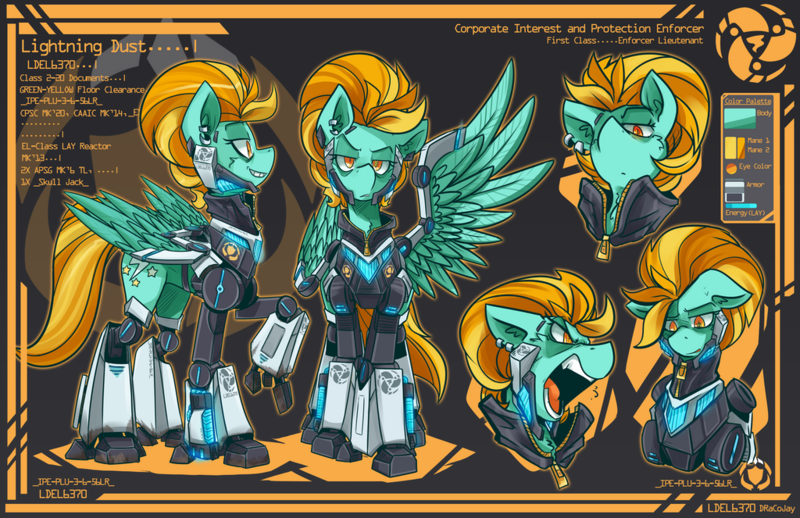 Devastating the world with years warfair with new magitech weapons ponies were forced to live in vast flying mega cities as the world below them was changed and corrupted in to something horrific. Yet the gears of progress pushed on. In this universe A pony named Lightning Dust was born. Tenacious, cold and driven to be on top she did whatever it took to follow her dreams at whatever cost to others. In a world dominated by warring mega Corporations she found her ideas not only liked but wanted by powers far greater than the famous LAY Racing team “Thunderbolts”, she welcomed the offers after losing out to joining the Thunderbolts to a mare named “Rainbow Dash”. Joining on as a Corporate Enforcer she soon found the job much to her liking and soon started to climb ranks. It was the best day of her life when she was promoted to Lieutenant as she had grown to worship them as beacons of her dreams. Rich, powerful and feared by the working class and even nobles Enforcer Lieutenants were the voice and blade of the Corporations. But she soon found they paid a terrible price for it. She was forced to undergo cybernetic implants and upgrading. Her free will was removed, she acted like her hold self but inside she was just a slave acting free. She had no freedom to say no to her masters, she did as told without hesitation and followed orders blindly hardly remembering why. In time she stopped battling it and found joy. She loved serving the Corporations. She loved the CEOs, they knew best and all were blind that did not think so. They were the true gods of ponies. Chained to there will she proved her worth and soon was promoted to Lieutenant First Class. The leader of the Lieutenants and first hoof of the CEOs she was feared in all levels of pony life as no nobel was safe from her judgment and no homeless outlaw could outrun her forever. It was here she was given her most risky orders yet, their homeworld was dieing. The years of warfare and the use of LAY was killing the world, sucking it dry of magic and resources. So the Corporations in a complex web of dealings and proxy wars began a joint project. Gate Kicker. Some of their most trusted servants were to be teleported to other universes to find new worlds to explore, expand and exploit for the Corporations. The most promising universes was named TK78, it was overflowing with magic and raw LAY, the world was livable and populated by other ponies and looked to be lacking in comparable technology. Feeling confident this was the world they were looking for they called for Lightning Dust and briefed her on her duty. To explore the world, find a weak place in the walls of the universes and deploy the universes anchor to open a permanent gateway so the armies of the Corporations can overwhelm the world and claim it. With pride she took too her duty and using the most advanced minds of the Corporations they built a small one way gate, without an anchor just keeping a gateway open for more than just a blink of an eye was difficult so she had to go alone. Trusting her fully she was deployed. Lightning Dust teleported just outside a major city and for the first time in her life found her thoughts free. All she had done for the Corporations crushed down on her like builders. The faces, tears, blood and her heartless smile. but soon as she had her moment of freedom it was forced away, locked behind doors as the implants came back online. Cut off from her home they were running on autopilot with one order hammering in her brain. Find the weak spot, deploy the anchor… DEPLOY THE ANCHOR, FOLLOW ORDERS, FIND THE WEAK SPOT, FOLLOW ORDERS! … For good Enforcers follow orders. Notable Allies: N/A on TK78 at the moment. Notable Personal Villains: N/A on TK78 at the moment. General Notability: Currently has no notability on TK78.